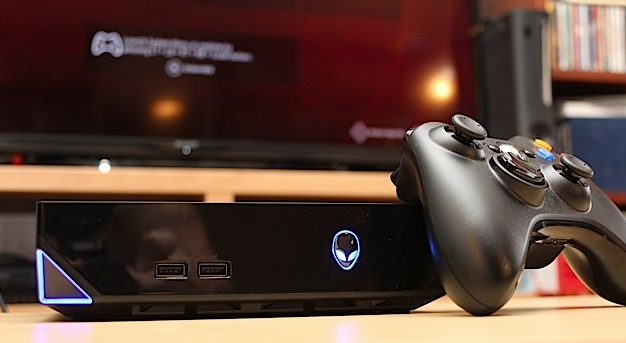 When it comes to PC Gaming Alienware leads the race .Of course It’s hard to describe the Alienware Alpha. On the surface, it’s a small-form gaming PC, custom-built from laptop components to fit in your entertainment center. But it was supposedto be a frontrunner in a new category of gaming devices. As it turns out, it’s pretty awesome. At 1080p, it’s been able to play any game I’ve thrown at it at High/Very High/Ultra settings, meaning those games all look way better than they would on the latest Xbox or PlayStation. Thats because Alienware Alpha has got great hardware for the money. Alpha comes in with a quad-core Core i5 processor, 8 GB of RAM, and a custom version of the Nvidia 860m graphics chip found in many mid-range gaming laptops that Alienware says they boosted for better performance (it’s also got 2 GB of RAM all for itself). when you boot up this guy there’s a little flair, of course: The machine’s power button is formed in the shape of the signature Alienware logo and one of the machine’s front corners is bisected at a sharp angle. An LED glows around the perimeter of the cut. It won’t stand out in a bright room, but it’s enough to let you know the device is turned on. But there are only two USB ports lingering on the device’s front, but folks hurting for connections can find two more on the machine’s back edge and, oddly, an extra USB input hidden behind a panel on the Alpha’s undercarriage. The compartment is large enough to conceal most wireless mouse and keyboard dongles , but sadly, it’s far too small to contain the Alpha’s included wireless Xbox 360 Controller adapter. first booted up the Alienware Alpha: I wasn’t greeted with Steam Big Picture mode or even Alienware’s own Alpha interface, but with the Windows 8 profile setup screen. Stumbling through the Window 8 setup screens with a gamepad-emulated mouse is an imperfect experience, but it’s enough to get the job done. Cursor movement is a bit stiffer, largely flowing in strict horizontal, vertical and diagonal lines. It feels a little unnatural, but it’s good enough to get the job done. If you’re flinching at the prospect of running Windows 8 on your TV, Alienware put in effort to minimize the time you have to spend in the full PC interface. Most of the time, you’ll be able to boot into the “Alpha UI,” a thin layer on top of Windows that puts you straight into Steam, the de facto store for most PC games. Here, Steam’s “Big Picture” mode hides the complex desktop interface you’d normally see and presents a slimmed down experience that you can quickly navigate with a controller. Without hesitation, I can say that the Alpha’s built-in mouse emulation is the killer feature here. It’s more than a simple thumbstick-to-cursor mapping; it’s a small collection of gamepad shortcuts designed specifically to sidestep the problems Windows 8 presents in the living room. Let’s say you run into a game launcher that requires cursor control. Simply hold down the gamepad’s triggers and shoulder buttons, and depress the left thumbstick — you’re ready to go. Point and click. Did a game launch in a window instead of full screen? Use those same four buttons and press up on the d-pad. Done. Pressing left and right (with the same combo, of course) alt-tabs among active apps and pressing the Xbox Guide button calls up an all-purpose kill menu. It’s a simple solution, and it let me fix almost every issue I encountered from the comfort of my couch. In fact, I only needed a keyboard twice: to enter a name in a game’s character creation screen and to log into UPlay for Far Cry 4. “Origin issue” represents an attitude that both serves and harms the Alpha. On the one hand, it shows that the Alpha recognizes that it’s a machine straddling two disparate worlds: PC and console gaming. On the other, it fails to integrate those worlds, leaving gamers who live in both frustrated by limitations tailored to only one side of the machine’s identity. This “nanny-console” dichotomy rears its head elsewhere, too: The machine won’t allow the user to activate desktop mode unless they plug in a physical mouse. Again, this seems reasonable, but it’s also odd; between the gamepad’s mouse emulation and Windows 8’s onscreen keyboard, the desktop is completely navigable without traditional peripherals. Dell has pledged to push out Alpha UI updates every month — and adding support for Origin in console mode is supposed to be included in one of the first releases. 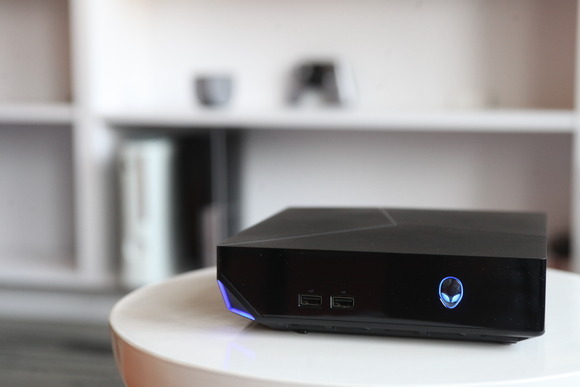 The Alienware team practically admits the product’s name is a half-pun: Its software actually is in alpha. It needs expansions and patches, but at least they’re on the way. Before I put the Alpha through its paces, I made sure to consider what it was. Yes, it’s a gaming PC, but one that has more in common with a laptop than a tricked-out desktop. At the heart of my $549 review unit was a dual-core 2.9GHz Intel Core i3 CPU, 4GB of DDR3L RAM, a 500GB 5,400RPM hard drive and a custom NVIDIA GeForce GTX GPU with 2GB of GDDR5 video memory. That’s the base configuration. Dell also offers a $699 version with twice as much HDD space and RAM; a $799 variant with a Core i5 CPU; and a high-end $899 model with a Core i7-4765T and 2TB of storage. So what do all those stats add up to in performance? Some pretty decent gameplay, actually.Crysis 3 and The Witcher 2 — two of the most resource-heavy games in my library — ran at 31 and 39 fps on high specifications, respectively. Both naturally locked in smoother frame rates with minor concessions. Battlefield 4 netted a tolerable 36 fps on Ultra, and went as high as 41 and 70 on high and medium settings, respectively. The futuristic warzone of Titanfallstuttered a little on maximum settings, but was fully playable on high (34 fps) and medium (42 fps) specs. BioShock Infinite punched in at 64 frames per second at maximum fidelity, too. Looking for something newer? Fine: Far Cry 4 runs at a steady 35 fps on high settings, and sails to 46 fps on medium. Not bad at all. The Alpha did better than I expected, but counting frames only tells half the story. While it’s true that most games ran great “out of the box” and could often be configured to look a little better, some had problems. Battlefield 4 and Call of Duty: Advanced Warfare both suffered from notable stuttering — momentary freezes and hangs bad enough to make me give up on playing the latter title altogether. Some games won’t run at all: Dragon Age: Inquisition requires the latest NVIDIA drivers to run, but the most recent update isn’t yet available for the Alpha’s semi-custom GPU. These issues will probably be fixed in a future update, but they’re clear growing pains, and they aren’t pleasant. it’s important to keep perspective on what, exactly, the Alpha is. Yes, technically speaking, it’s a gaming PC, but one that has been designed specifically to compete with the PlayStation 4 and Xbox One. It doesn’t have to run PC games at their maximum settings to do that: Medium and high configurations on the PC version of a game can often rival the visuals of its console counterparts. What’s more, middling graphics configurations on the Alpha can translate to a good-looking game running at 1080p while pushing 60 frames per second or more. That’s something most console games can’t do. The Alpha doesn’t always best its competition (and almost never beats it in load times), but when it does, it’s a notable difference. What’s most impressive about the Alienware Alpha isn’t its speed or price, but that fact that it manages to squeeze so much power into such a tiny package. The Alpha is a more powerful machine than either of the latest and greatest consoles, but its all contained in a device with a smaller footprint and far less volume. If you’d like to have a gaming rig that can also serve double duty as a media center than can handle all kinds of content, are space constrained, and are willing to pay the premium over traditional consoles, the Alpha is a tough machine to beat. it’s still difficult to recommend. If you absolutely have to have a Steam Machine right now, this is the one you want — but it’s a mere stepping stone toward bigger, better and more complete PC game consoles. It’s not quite user-friendly enough for the average console gamer, but it’s still too limiting and simple to satisfy most PC gamers. If you’re somewhere in between, this is the product for you. Previous Previous post: Facebook Won’t Add a ‘Dislike’ Button . Next Next post: Sony Pictures Hack: 10 Latest developments.